...with a big pond in the backyard for several years. The pond was properly shaped for swimming, so he fixed it up nicely with picnic tables, horseshoe pits, and citrus trees. ...the old farmer decided to go down and check on the swimming hole, because he hadn't been to that area of the property in a while. He grabbed a five-gallon bucket to bring back some fruit. As he neared the pond, he heard voices shouting and laughing with glee. He made the women aware of his presence, and they all went to the deep end. One of the women shouted to him, "We're not coming out until you leave!" 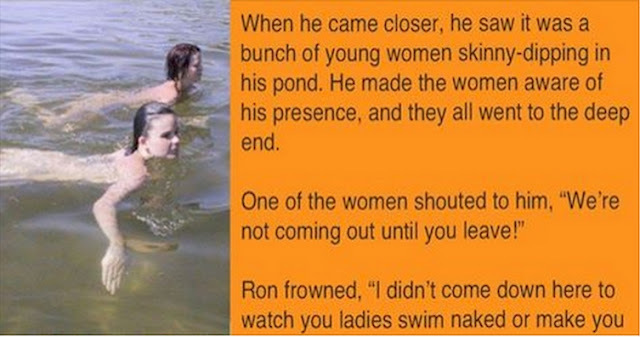 Ron frowned, "I didn't come down here to watch you ladies swim naked." Rob held the bucket up high and said, "I'm here to feed the alligator."